The guy who claims he was fired after getting the doobie-ous title, first person to buy legal weed in Washington, says he's already on the hunt for a new job and he's trading on his newfound stoner fame. Mike Boyer, a security guard in Spokane says he was sacked after making the news for being the first guy in the state to buy legal buds. Mike says his employer made him to take a drug test, but he told them he'd fail, so his employer gave him the boot before the results came in even though he says his record was spotless. Mike says he doesn't regret his new-found distinction and now he's looking to cash in on his local fame. He's hit up every dispensary in town and filled out an employment application. 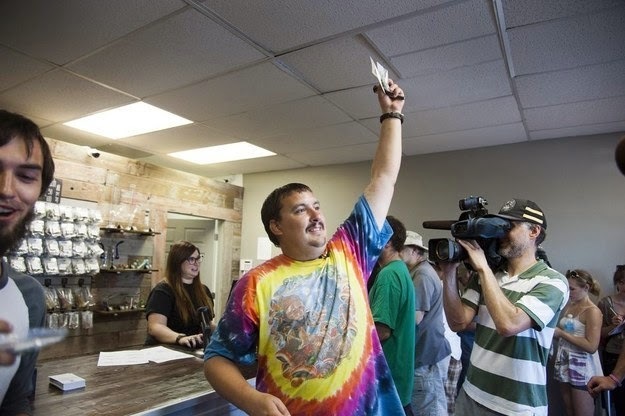 Mike adds, "I'm the number one guy for legal weed in Washington.